St. Athanasia was born in Greece, in 790. She died on August 14th, 860. She lived in the Byzantine Empire and was an advisor to Empress Theodora II. Her life is contained in a Vitae, of 916, and the author is unknown, but it is believed to have been written soon after St. Athanasia’s death. Athanasia was the daughter of Christian Nobles, and experienced a mystical union of a star merging with her heart while weaving at the loom when she was a young girl. She wanted a spiritual life but an imperial edict required all single women of marriageable age to marry soldiers. With her parents urging, at that age of 16 she complied and married a young officer. Sixteen days after their wedding, her husband was killed in a battle with raiding Arabs. She again married, this time to a deeply religious man who felt drawn to become a monk and left with her blessing to do so. Athanasia then gave away the bulk of her possessions, and converted their home into a convent and began building Churches. She served as an Abbess and was known for her miraculous healing of the sick and those possessed. Her community later moved to Timia, near the ancient Church of Stephen the Protomartyr. Large crowds sought her out, and she fled to Constantinople seeking solitude as an Anchoress in a cell for seven years. In this cell, she was an advisor to the Empress Theodora II. After the seven-year period, she returned to Timia, where she died three days later on August 14, 860. Her relics are preserved at Timia in a reliquary and they are revered for their healing powers. 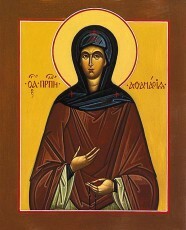 St. Athanasia was born in Greece in 790. She was drawn to the religious life, but there was a law in her time that young girls of marrying age had to marry a soldier. She married at the age of 16, and two weeks later her husband was killed. She remarried a very religious man, who felt drawn to become a Monk. She blessed him to go – and she turned her house into a Convent. She started a community and became their Abbess. She was well known for her miraculous power of healing the sick and those possessed. She died on August 14, 860 and her feast day is April 18th.